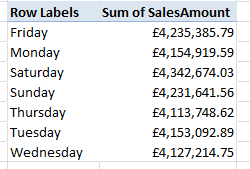 In the previous post in this series I looked at how MDX set expressions could be used inside Excel to give you total control over what appears on the rows and columns axis of your PowerPivot PivotTables. However, I only showed how to construct basic MDX set expressions using members and tuples; in this post I’ll show you how to use two of the commonest MDX set functions: Members() and Crossjoin(). 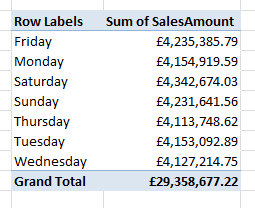 Here, I’m asking for the crossjoin of all the members (except the All Members) on the CalendarYear, EnglishDayNameOfWeek and EnglishProductCategoryName hierarchies and not requesting any subtotals or grand totals at all in the query. The larger the number of hierarchies on rows or columns in your PivotTable the more noticeable the improvement in performance will be when using this MDX pattern. The penalty for doing this, though, is that end users lose the ability to drill up or down or to alter the selection made without editing the MDX. In part 4, I’ll take a closer look at how to filter sets.